New soybean technologies have helped control herbicide-resistant weeds and allow growers to select the technology that will work best on their farm. The freedom to use multiple technologies is great for soybean growers, but it can cause some headaches when there is no way of telling which technology is planted where. Furthermore, application restrictions associated with the geographic relationship of dicamba tolerant soybeans to non-dicamba tolerant soybeans makes it even more important to know what is planted throughout the countryside. At Burrus, we have encouraged growers to use the Flag the Technology system, created by the University of Arkansas, to not only let you know what technology is planted, but also let your neighbors know. We are excited to announce a new joint effort with Bayer CropScience for the 2018 growing season. 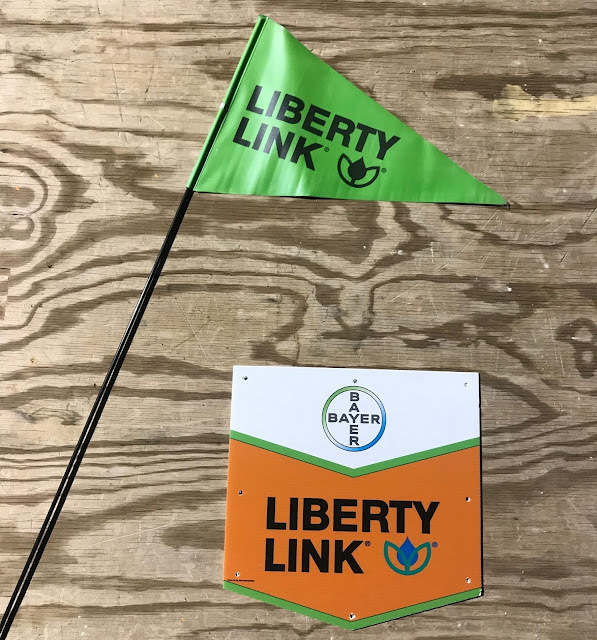 We will provide one LibertyLink® flag per box or pallet of LibertyLink seed purchased (partial pallets not included). This amount of seed covers approximately 60 acres which represents the average field size throughout our Burrus footprint. Flags are also available for purchase if you have smaller field sizes, are planting a different technology, or if you did not purchase the qualifying amount – ask your Account Manager for specific details. We advise placing the flag near the field entrance immediately following planting the soybean field. This will help growers keep track during busy times of the season and will also let neighbors know what technology you have planted when they/their applicator makes a herbicide application. We believe this program will help reduce confusion throughout the growing season for the grower, applicator, and neighbors. If you have any questions regarding this program contact your Burrus Account Manager. Can Cold Winter Hinder Crop Disease? Many have been talking about how the winter will affect populations of overwintering insect pests, but how will this cold winter affect the incidence of crop disease? Fungi can tolerate the range of temperatures that typically occur in the place where they have taken up residency. 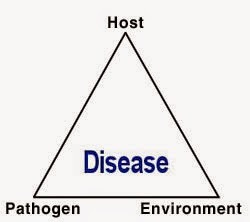 So, fungal disease pathogens that have made a home in the Midwest, generally have developed the ability to tolerate our cold, winter temperatures. Fungi have figured out several ways to survive cold temperatures, and many produce special survival structures that are thick walled, which can survive extended cold periods as well as extremely dry conditions, within residue or in the soil. It depends on the type of fungus, but typically most fungi require some basic items: respiration, nutrients (nitrogen or other minerals), water, light (but not in most cases), and specific temperatures. Spring and summer bring warmer temperatures for fungi to become active and produce spores once again. However, most plant pathogens that cause disease require an even more narrow range of specific temperatures before they will sporulate (produce spores) or initiate infection. Fungal spores, of course, are one of the main ways that fungal pathogens spread among crops. Don't forget that some fungal disease pathogens do NOT overwinter here in Illinois. Most rust disease pathogens require a living plant for survival, and these are more abundant in the South during the winter. Rust spores blow up from the South and under the right conditions, can infect plant hosts during our growing season. Some examples of rust diseases that infect corn are common rust and southern rust. Soybean rust can be an issue on soybeans, but, fortunately, this disease has not been a yield reducer in the Midwest. Soybean rust has infected soybeans in the Midwest, but historically has been found late in the season, which is not cause for alarm at this time. 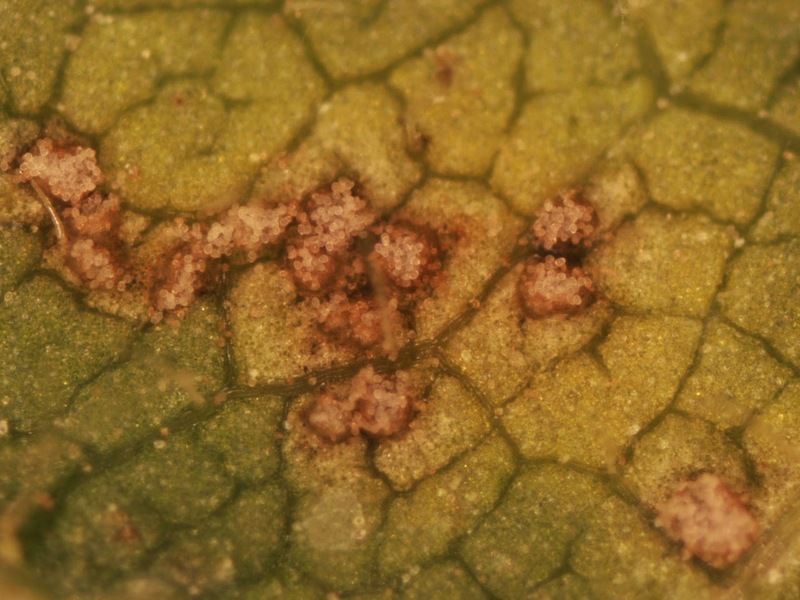 Up close picture of soybean rust (Phakopsora pachyrhizi) pustules on a soybean leaf. Picture taken by Mike Meyer. The good news is that a severe winter in the South, where rusts overwinter, could decrease the amount of spores that are blown into "our neck of the woods". This is because the colder winter temperatures in the South can decrease the amount of living plant material, where these rusts are overwintering, which in turn, causes the demise of the rust pathogens. Reduced amounts of corn and soybean rust disease in the South will most likely mean less rust spores will make their way North. However, it is hard to predict the future, and rust disease scouting should continue throughout the growing season. Track the movement of both Southern rust on corn and soybean rust as they infect and spread on crops in the US at the iPIPE website. 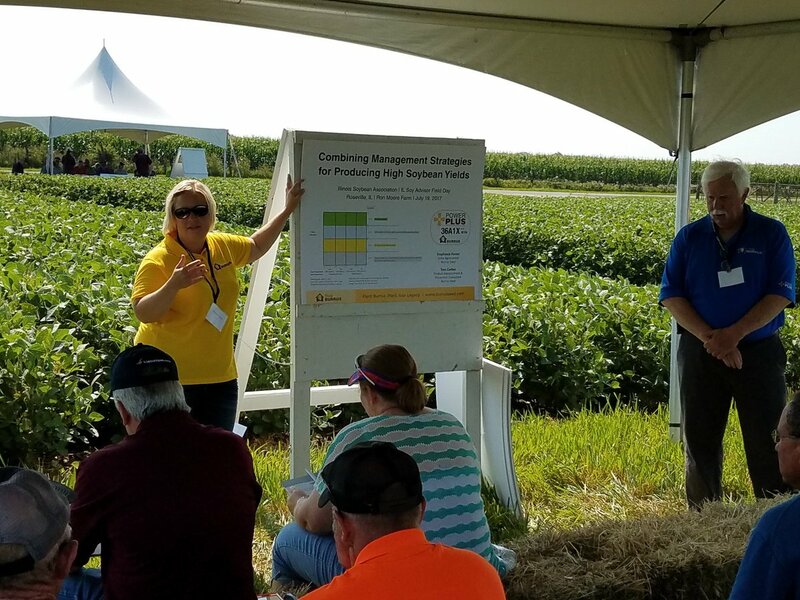 On July 19, 2017, the Illinois Soybean Association’s ILSOY Advisor Field Day took place in Roseville, IL on the farm of Ron Moore, current President of the American Soybean Association (ASA). As a presenter, I spoke with growers answering questions about incorporating management strategies to increase soybean yields. The foundation of this discussion was Dr. Fred Below’s Six Secrets of Soybean Success, but was focused on remaining profitable and sustainable in the future. Stephanie Porter and Tom Corbin representing Burrus Seed at the ILSOY Advisor Field Day. Weather is the #1 influence on soybean yields. We can’t control Mother Nature, but we can plant early to obtain more sunlight or photosynthesis. Plant at the same time as corn, but make sure the soil is fit. Next, look at the extended forecast and do not expose to temperatures below 50° F for the first 24-48 hours during their rapid water imbibition period. After this time, soybeans should be tolerant to cold but there can still be a frost risk after emergence, especially moving north. Hands down, fertility has been most instrumental when it comes to obtaining soybean yields above 60 bu/a. In the past, our fertility program centered around corn and our soybeans often got the “leftovers.” Recent research has focused on fertility needs of soybeans at key times during the growing season. Soil test often and supply soybean crops with P (phosphorus) and K (potassium), so they are not limiting factors of yield. Because most soybean yield (60 – 80%) comes from the middle of the plant (nodes 5 – 16), it is vital to protect that yield by applying a fungicide or insecticide at the growth stage R1 – R3. Canopy protection is needed to protect critical reproductive growth stages (R1 – R5). Soybean varieties can differ in disease and aphid tolerance, and scouting fields throughout the growing season will guide economic foliar management decisions. Limited soybean yields were not attributed to a single insect in 2017, but rather a combination of pests. The rate of soybean genetic gain has increased with investment and new breeding methods. When planting early, growers should choose the right variety that is a fuller maturity to increase yield. Since early planted soybeans will have a longer time to grow before bloom, they may grow taller; therefore, a reduction in planting populations is suggested not only to help encourage branching (more nodes/pods) and reduce lodging, but also to alleviate some disease issues. Many university studies have shown that narrow row soybeans produce higher yields. Dr. Below’s work has also shown crop yield in narrow rows is more responsive to increased management as discussed throughout this article. When planting early, seed treatment such as PowerShield® for sudden death syndrome (PS SDS) is a must not only for root rot protection, but also for management of SDS and early control of soybean cyst nematode (SCN). Don’t forget the insecticide (neonicotinoid) can not only increase vigor, but also manage early season insects, such as bean leaf beetle. A systems approach of many different management strategies is required when seeking high soybean yields, but factors such as field drainage, proper pH, planting depth (1.5 - 2 inches), and weed control should not be ignored. We want each soybean plant to be a factory with efficient production, while overcoming potential limiting factors. When thinking high soybean yields, one must be willing to take risks to earn rewards, while incorporating good agronomics for success.